1. Top Fashion for Spring 2018: Check out the biggest trends from designer runways for Spring 2018! 2. Spring Decor Ideas: Tired of winter? Me too. Spruce up your home for the upcoming season with these great ideas! 3. Sunday Brunch: Break out the eggs, bacon and... ricotta? Check out this unique twist on the classic omelet! 4. Happiest Country in the World: We may not be the 1st on the list, but Canada made it to the top 10 for happiest countries in the world! Check out how we ranked! 5. 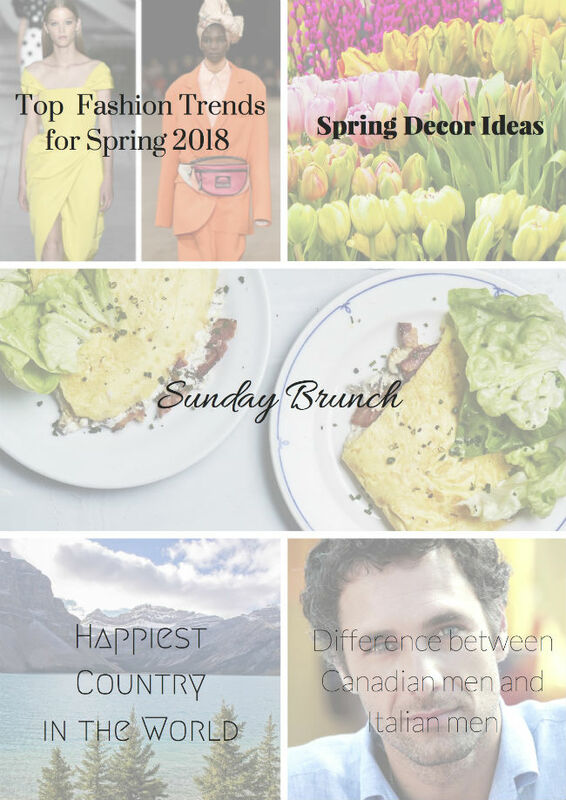 Difference between Canadian men and Italian men: Join blogger, Jasmine (a Canadian living in Italy), from Questa Dolce Vita, as she comically describes the "subtle" differences between Canadian and Italian men. GRAZIE MILLE for the feature!!!! This is the top ranking post this month so I'm sure it's because of you! Baci! !